"This recipe is great with vanilla ice cream or yogurt. It's my first year trying the crust and haven't looked for another pie crust recipe since. 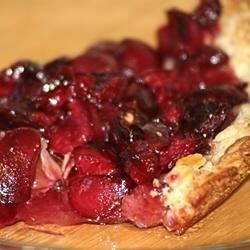 If desired, mix 1/4 cup of wheat germ into the pie crust dough." In a medium bowl, cream together margarine, brown sugar and vanilla. Stir in oats, flour and water. Then press mixture into 9 inch pie pan. In a medium bowl, stir together the cherries and sugar. Pour into the crust. Bake in preheated oven for 12 minutes, or until crust is golden brown. I don't think I'm going to save this one...I think I'd rather have the calories & fat, etc. It wasn't terrible, but there are better ways to eat cherries!! !